We’re offering some lovely and intriguing concerts through the next few months starting with the Elgar recital on November 13th, Remembrance Sunday, at 3.00pm in St Andrew’s Church. The next Wednesday lunchtime concert is on October 26th at 1.00 in St Andrew’s Church. We are busy rehearsing for an exciting concert this Sunday, June 5th – 3.00pm at St Andrew’s Church. It is a great pleasure to be working with Anna Noakes, whose flute playing includes concertos with the London orchestras, film work and her own tango band! We have a change of pianist and welcome back John Stafford who is known to most of you as a brilliant musician. Our programme includes a delightful trio by Weber, music by French composers, Faure, Poulenc and Gaubert, and a brilliant trio by Martinu, whose upbringing in a bell tower is resonant throughout the work. We have several concerts coming up including a mini tour of the memorable 1940’s wartime show which we put on last summer. Several people have said they would like to see it again, so I am including the details. 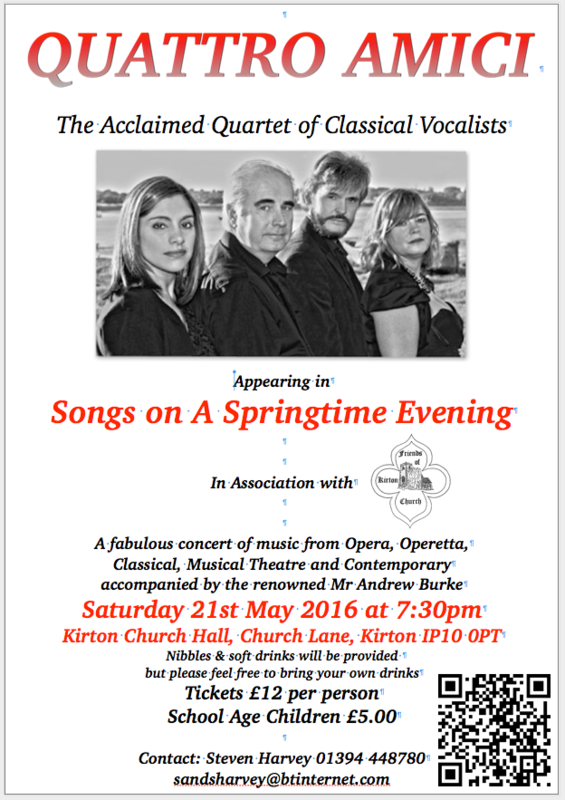 We will be performing it at Peasenhall Village Hall on Saturday 30th April at 7.30 - booking through Tricia Maguire on 01728 660022. The other performance is at St Mary’s Church Harkstead (on the Holbrook peninsular) booking through Jane Goyder on 01473 328314. The next concert in our series is on May 8th at 3.00pm when Mark Messenger, head of strings at the Royal College of Music, will be the leader in a programme which includes the Schubert Cello Quintet and Haydn’s “Lark Quartet”. This concert will be at St Peter and St Paul’s church (Old Felixstowe). 4 May: STOP PRESS! Mark Messenger is unable to play in the Schubert quintet on Sunday, but I'm delighted to say that Roland Roberts is stepping into his shoes and it will, no doubt, be brilliant. The next Wednesday lunchtime concert will be on May 18th at 1.00pm at St Andrew’s Church. John Stafford and Christine Whiffen will present a piano duet recital which will include the famous Schubert Fantasy and Fauré’s Dolly Suite. I am delighted to report that I have recently received the Mayor’s award for services to Felixstowe. As I said recently at the Brahms Requiem, it is due to the support of all the musicians and audiences that the series has been so successful, so “thank you” to everyone. After a really busy weekend, when we helped to raise nearly £4,000 for St Elizabeth's Hospice and gave another very well-received quartet concert at Waldringfield, I'm writing to remind you about our forthcoming string orchestra concert. The Classic Strings Orchestra – on March 13th at St John's Church, Orwell Road at 3.00pm. The programme includes Eine Kleine Nacht Musik, Mendelsson String Symphony no. 12, Elgar Serenade and Haydn Organ Concerto played by Philip Simms. We are just about to send out our Spring brochure. If you would like a copy and don’t normally receive them by post perhaps you could email your address to . There’s a copy of the brochure available here. The next concert is the Ward Quartet on February 6th. Caroline Ball, who was originally booked for this concert, is ill, and Peter Pople of the Alberni Quartet has agreed to step in at the last moment. We will have great pleasure in playing for the Charity Gala on February 26th, in aid of St Elizabeth’s Hospice. Clorinda Smith will be playing the piano for a part of the concert and reciting some of Edith Sitwell’s words from “Façade”. First session is free or just come and watch some time.